On two computers today with Malwarebytes installed, I received a potential threat and decided to quarantine. I looked in Chrome settings and Windows Control Panel, and nothing of the sort (MySearchDial) exists. Any ideas on where this would come from? It looks like a legit detection, MalwareBytes can detect and remove Chrome settings hijacked by adware which are stored inside files you can see on the image above. If you could export the scan report that would help confirming it is a legit detection. Thanks for looking...following is the export. The scan came back positive again this morning. Odd thing is, when I Quarantine, the Chrome browser closes. I get this every morning. Sorry for delayed answer. Yes, it looks like a valid detection. I'll need some more logs to see what is the problem and why it keeps coming back. When you open the tool, click Advanced and then Gather logs. When it is done, you'll find a zipped archive on your desktop. Attach it in your next reply. Thanks @TwinHeadedEagle .... I really appreciate it; The zip is attached. Odd that it's coming from Chrome and happening when I open the browser every morning. Upon further thought, I can uninstall and re-install Chrome if you think best. I'll wait to hear back from you. Thank you. I've spotted a problem and we're investigating it. I'll come back to you later today with findings. I got google chrome synced up with 3 PCS and 2 android devices. I also get this, I keep removing it, but it keeps coming back. It only shows up on the PC devices and not the android devices. Please any help would be useful. 2. Run one more scan and try to quarantine when MalwareBytes finds this detection. When it is done, you'll find analysis.txt in the same folder. Attach it in your next reply. 4. 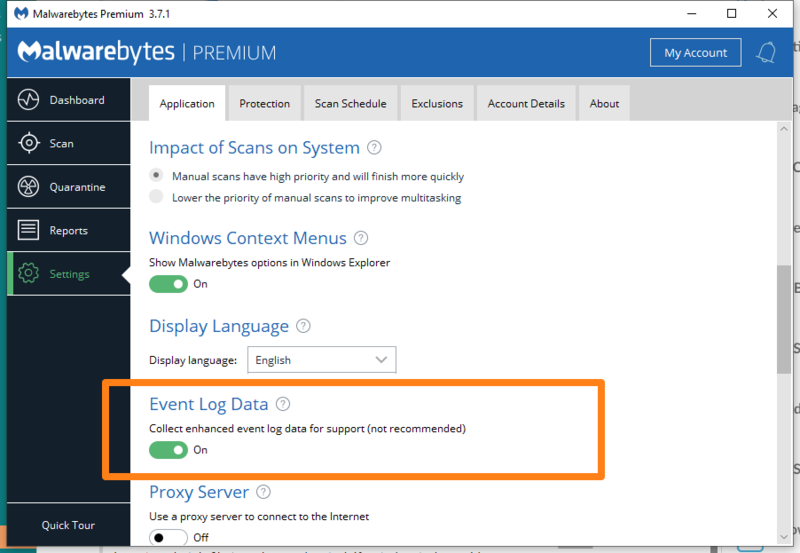 Run MalwareBytes support tool like you did before and attach fresh logs. Hello, I am not able to get rid of mysearchdial pup. I have had this for several days and I keep doing quarantine and delete but it seems to come back every time I open Chrome. Will uninstalling Chrome and reinstalling it help? I have done a reset on the chrome settings , but there are still 2 files that have this pup. How can I get rid of this? Can you follow the steps above? The chrome analyzer says its unavailable. Also, The only way i saw to get rid of it was not using the google sync anymore and doing another full scan of malwarebytes. What is the name of the chrome analyzer tool. I have been looking online for it but there seems to be several different ones. Your link does not work. That is a custom made script with some System Internals tools. There's no tool under such name, it is just a folder name. Your chrome analyzer is a broken link. You have to fix that. Were you able to get rid of mysearchdial pup yet? I got rid of one of the two, but I still have one that won't go away. For the one that I finally got rid of, I changed a few settings in chrome and then ran adwcleaner. So I don't know which of these two things that I did that got rid of it. @Jumpercable Download works fine for me. I just tried it again and it still does not work for me either. Hey @TwinHeadedEagle, the Chrome_Analyzer.zip shows unavailable so I can't accomplish step 3. Can you try with this link? Attached is the analysis and the mbst-grab-results.